Whenever one mentions the word “shaver”, most of the time, it would be one of those things that we tend to take for granted – whether it is for the guys, or for the ladies. 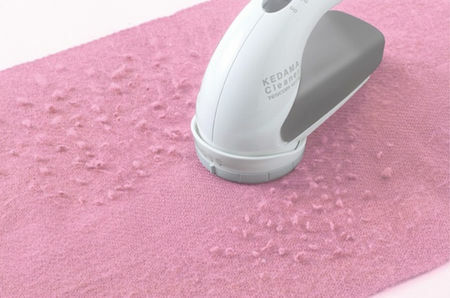 However, when you take a look at the $55 Tescom Pill Remover Fabric Shaver, things are very different – and this has nothing whatsoever to do with shaving facial or bodily hair. No sir, this particular “shaver” or so it is deemed to be one, happens to be an electronic lint, hairball, bobble cleaning brush. This means it is not only perfect for use with clothing, it also does the likes of rugs, sofas and other fabrics without batting an eyelid. With the Tescom Pill Remover Fabric Shaver, you will be able to get rid of them pesky hairballs and bobbles that tend to accumulate with the passage of time. This compact electronic brush happens to be simple in design, but it is very effective in functionality, taking mere seconds to cleaning lint or pills on clothes, without causing any kind of damage to the original materials. The AC adapter (100-240V) will also be able to function overseas, as it maintains the shaving power of the cleaner without a break.